1. Can you give an overview of what the term unified communications and collaboration means? It would be great if you could talk in details about the current landscape and also about the latest disruptions. Unified Ccommunications at Plantronics is about providing the tools that allow our employees to work rom wherever and whenever is most appropriate given the task to be performed. In an increasingly global and mobile environment, it is important that we use the same communication and collaboration tools regardless of where we happen to be working. Our enterprise relies on Skype for Business to enable presence, IM, chat, conferencing and video all enabled on our laptops or smartphones. Our social for business platform is Jive. It has flattened the organization allowing associates at all levels of the organization in every geography to share content and ideas. Both Skype for Business and Jive have increased innovation cycle time, increased knowledge sharing and greatly improved our ability to communicate both internally and with our customer, suppliers and partners. 2. 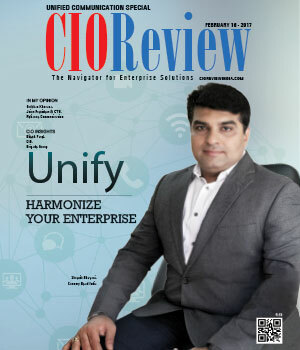 Despite the fact; Technology has touched every enterprise, we come across of our life and has tried to change the traditional ways of doing businesses, but still, there lies some challenges which still keep the CIOs awake at the night. According to you, what are some of those challenges that still need to be addressed and what is your take on trouncing those? Our biggest challenge is keeping up with the demand for IT innovation. Resources are limited so project portfolio and governance has become even more important as we ensure that we are making nvestments on projects with the highest return. Unlike the IT gatekeepers of the past, our approach is to lead with yes, understand the problem, determine how to best solve it and then decide how it ranks in terms of business value. 3. There are several technology trends which you perhaps would be observing (bigdata, social media, mobile, cloud, IOT). Can you share with us 1-2 trends that will have significant impact on your enterprise business environment—Unified- Communication? Mobility is important at Plantronics. Work is not a place to go but something we do and having the right mobile technology is key to ensuring that our associates are connected, available and productive. Our IT Service Desks around the world have made the adjustment to extend service beyond our physical boundries. Our remote support tools allow us to take control of a system regardless of where it happens to be. Who would have thought that we would be helping to troubleshoot WiFi hotspots at homes and coffee shops! Cloud computing has been a big win at Plantronics. We were early adopters of Salesforce.com for sales, marketing and support and have added dozens of other SaaS application services. Cloud apps also help with our mobility strategy making it easy to connect and do business remotely without the need for VPNs. We have also adopted PaaS and IaaS solutions which have allowed us to add IT services without having to add data center headcount. The clould has allowed us to focus on our core business while scaling our IT services and solutions. 4. What are some future trends for UCC in the workplace? What would be your piece of advice for companies to warm up their strategies in order to stay future-proof or to embrace the new wave? My first thought is to get started, even if it is a pilot. We found adoption to be viral with presence, IM and desktop share leading the way. UC solutions have evolved to the point where they simply work, including enterprise voice and scalable conferencing. WebRTC will make it even easier to deploy but there is no need to wait. Tools are in place to ensure smooth deployment and management. 5. With your rich experience of managing IT organization and steering technology for your enterprise, can you please share some of the unique lessons learned and your advice for fellow CIOs? My goal has been to hire and retain top talent, ensure that they have the resources required to get the job done and then get out of the way. Innovation starts with the experts, not the CIO. I also like to emphasize leading with yes. Everyone in the enterprise understands IT and trends like BYOD and cloud solutions need to be managed by IT. Our business partners know what tools they need to be successful. IT is here to help with configuration, integration, scalablity and security. It’s all about collaboration and partnering!